THE 2nd ED. OF THIS BOOK IS FORTHCOMING. PLEASE EMAIL FOR DETAILS. 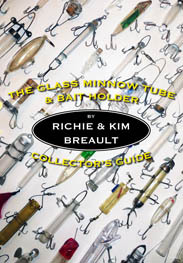 Glass minnow tubes and bait holders were very popular, beginning with the 1893 patent by Henry Welch that led to the famous Welch & Graves glass tube. From that point on, dozens of patents and production lures were crafted, all with the same idea of protecting live bait so that one minnow could last all day. Whether glass, celluloid, pyralin, plexiglas, plastic, or wire cage, this family of lures is fascinating and make for a wonderful collectible. 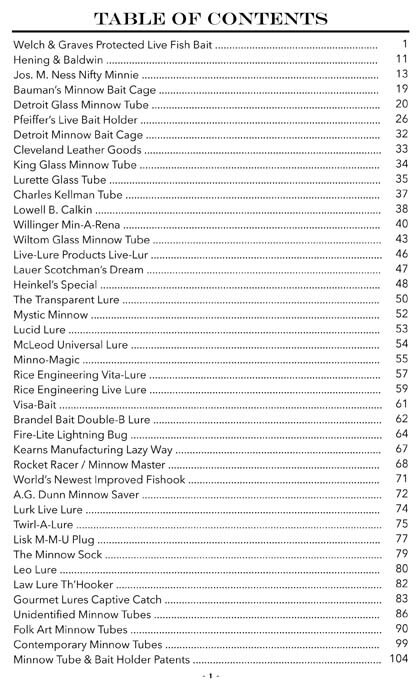 For the first time ever, Richie and Kim Breault have put together a comprehensive guide to these baits, including history and pricing. It is a must for any tackle collector, dealer, or anyone interested in the history of fishing and tackle. "When I started collecting minnow tubes years ago, I didn't realize just how many tubes and bait containers there were. As I added to my collection, I also noticed that there was very little information available. Only a handful of people had any knowledge about them and their worth. So along with my collecting, I've kept an eye on prices and I have also scoured through old magazines and books for information. This book covers all the older tubes as well as the newer ones, folk art and contemporaries. As with almost everything, the minnow tubes and bait containers aren't bringing the amount of money they used to but you still have the older ones like the Welsh & Graves and the wire bait cages that are still very valuable. You can spend anywhere from $5.00 to thousands of dollars depending on the tube or container. They are all unique and worth every dime. Hopefully this book will help future and current collectors to identify and get an idea of a tube or container’s uniqueness and worth. As with all collectibles when pricing, one must take into consideration the condition, original parts, scarcity, and age of each piece. With minnow tubes and bait containers, having the original box can double (or more) the price of a tube. I hope everyone enjoys this book as much as we enjoyed putting it together."